Pressure washers connect to standard garden hoses and use pumps, powered by gas engines or electric motors, to amplify the water pressure, providing the power necessary for a variety of cleaning applications. They are easy to use and a great for removing dirt and mold from siding, decks and concrete surfaces. rating. Both specifications are important when choosing which pressure washer is right for you. Pounds per Square Inch (PSI): This measures the pressure or strength of the stream of water supplied by the pressure washer. Gallons Per Minute (GPM): This measures the volume of water and can be used to figure out how quickly the pressure washer can clean or how efficiently it can rinse away unwanted debris. Electric pressure washers are the perfect choice for many homeowners. They’re lightweight, easy to use, easy to maintain and can perform the majority of household projects. Although electric pressure washers are not as powerful as most gas models, they pack a surprising punch. From cleaning your car to stripping away years of dirt from your driveway, electric models are the ideal choice for the occasional user. With no required seasonal maintenance or oil changes, it’s ready to start cleaning whenever you are. Residential gas pressure washers have the ability to tackle just about any household project. With more PSI and GPM than electric models, they can do more and finish equal jobs in less time. Pressure washers in this category are exceptionally powerful but have easy-to-use features so even infrequent users can feel comfortable operating their machine. 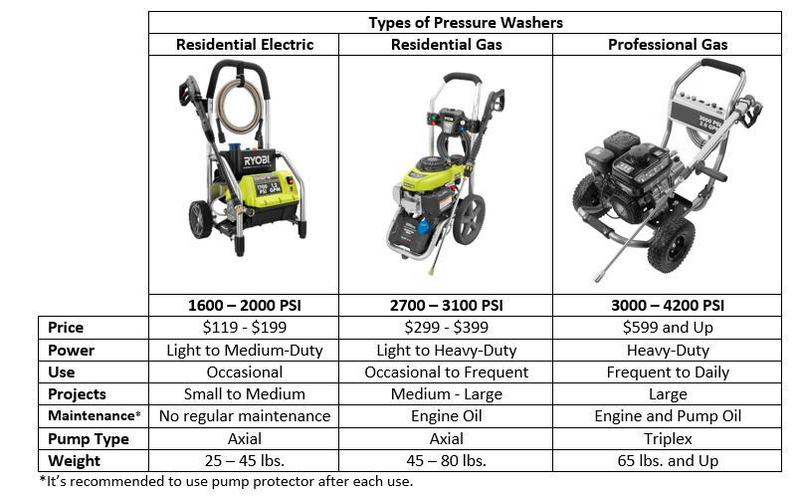 If you’re unfamiliar with pressure washers, this category can be confusing due to the variety of configurations and options. Thinking through what your common projects will be and what features are most important to you can help narrow your options. Idle-down: Lowers the engine’s RPMs when you release the trigger, saving fuel, reducing noise and preventing wear and tear on the pump and engine. On-board Soap Tank: When soap is in the detergent tank, automatically dispenses it when using a low-pressure nozzle. Electric Start: Start the pressure washer with the press of a switch, no manual pulling required. Professional units come at a premium but are great choices for contractors and daily users. Although many contractor-grade models have higher PSI than residential, often GPM is what separates them the most. This increased volume helps get the large jobs done quicker, but it requires more energy to control the wand. Most professional gas pressure washers have branded triplex pumps. Although these pumps cost more upfront, most can be repaired with parts readily available, making them a good long-term investment. Most pressure washers in this class require more frequent maintenance, but if well maintained, they can continue operating at optimum levels for years. Most pressure washers come with 3 to 4 standard nozzles. 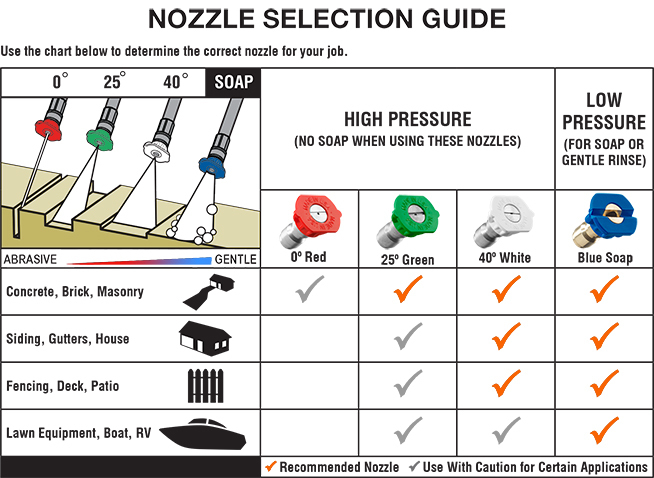 The most common configuration is a 0-degree, a 25-degree, a 40-degree and a soap nozzle. Although most projects can be done using these included nozzles, to increase the job quality and decrease the time it takes to get the job done, you may want to consider project-specific nozzles. Surface Cleaner: Pressure washing your deck, driveway or patio with a standard high pressure nozzle is like vacuuming your floors with a handheld vacuum. Sure, it’s possible and can do the job well, but you can save a ton of time and effort by using a tool designed for the job. Turbo Nozzle: Low degree nozzles are great, but due to the narrow spray pattern, it takes forever to clean a decent size area. The turbo nozzle delivers the power of a low degree nozzle with the spray pattern of a high degree nozzle. 5-in-1 nozzle: If you’re cleaning an area with a variety of different surfaces, the 5-in-1 nozzle can save you time by eliminating the need to constantly change out nozzles. Simply rotate the nozzle to your desired spray pattern and you’re ready to go. Make sure you read your pressure washer’s operating manual before starting any cleaning project. Most manufacturers recommended wearing gloves, safety googles, ear protection, long-sleeves and slip-resistant shoes while operating your pressure washer. Never operate a gas pressure washer indoors. Be cautious when touching a pressure washer, because they can become hot when in use. Always allow your pressure washer to cool before storing it.